Surround yourself with culture, art, and fantastic cuisine at this charming vacation rental cottage in central New Orleans! Offering both comfort and charm, the cottage accommodates up to 2 guests comfortably and is ideal for a solo traveler or couple looking to explore this exciting city. Just 2 blocks from the home, a streetcar will take you right into the French Quarter! This vibrant cottage is tucked away on a residential street, offering all the charm and character of the quintessential New Orleans experience with a spiral staircase leading from the kitchen area to the bedroom. Step through the French doors and into the well-equipped kitchenette where you’re sure to start your mornings with a fresh brewed cup of coffee from the Keurig. You’ll have plenty of room to store fresh produce or tasty leftovers in the fridge! Wash up in the full-sized bathroom before making your way up the spiral staircase to the second floor. The spacious bedroom features a comfy queen-sized bed and colorful accents, creating a welcoming retreat to return to at the end of the night! Settle in a Netflix or HBO movie on the flat-screen cable TV, and open the Juliet balcony for a lovely a fresh air breeze. The property is nestled in a residential neighborhood that is just a short walk from coffee shops, restaurants, boutiques, and more. 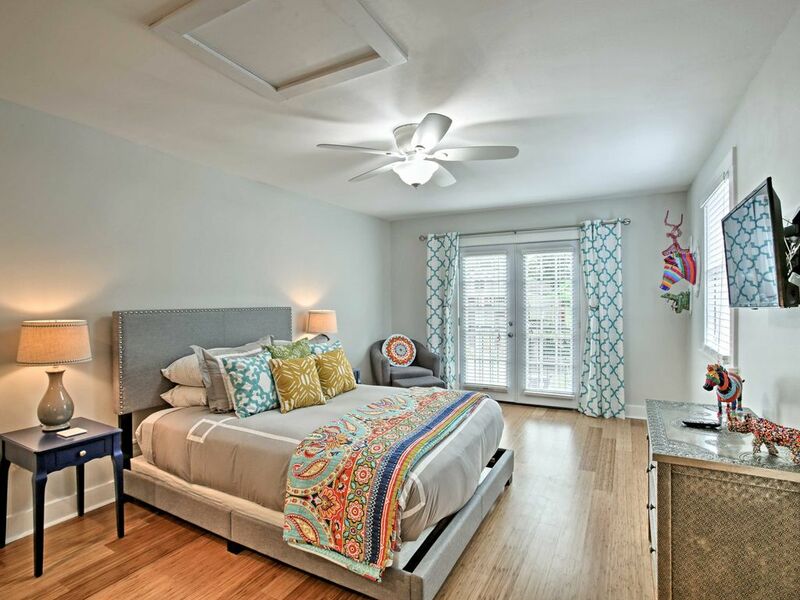 Situated just 2 blocks from the St. Charles streetcar line that takes you directly to the bustling French Quarter, you're sure to do your share of exploring from this excellent home base in the Uptown area! Oak Street is 5 blocks from your front door, offering a unique hub full of sights and culture. The area is a hotspot and favorite destination for college students, local writers, artisans, and musicians. Stop in for a bite to eat at DTB for a modern twist on Creole Cajun favorites! New Orleans is an incredible destination if you're looking to get your fix of history, offering a variety of museums and endless historic haunts. Stop by the New Orleans Voodoo Museum and pick up a souvenir like a chicken foot or love potion! Ranging from the infamous Mardi Gras parades to Jazzfest, French Quarter Fest, and even a fried chicken festival, there is no shortage of celebrations in New Orleans. Just 2 blocks from the home, a direct bus will take you to City Park where Voodoo Fest is held each October. No matter which month you choose to visit, you're sure to encounter a truly unique celebration or festival! - Central New Orleans location - Just 5 blocks from Oak Street for great shops, restaurants, pubs, and nightlife, 2 blocks from St Charles streetcar line, about 15 minutes from the French Quarter, 10 blocks to Tulane University, and more! It as small but the two of us didn’t need much room! The hot plate was perfect for eggs (our breakfast staple). The area was quiet and a short walk from the streetcars. We never had a problem getting a Lyft to anyplace in town! We loved our stay here!! Andrew and Liz were helpful in recommending dining experiences and available for any questions!! The place was wonderful. Great location and super comfortable. The hosts are wonderful and were very easy to get up with and accommodating. Definitely will stay again the next time in NOLA. This was a really wonderful, great place to stay! We had a great experience here. The apartment is clean and well cared for. The hosts have thought of everything you might need. They provided coffee and creamer and snacks and they even bought us a King Cake! Andrew was very communicative and helpful. He made sure we had all the information ahead of time and provided detailed instructions and pictures. He also had good recommendations for our stay. He was very accommodating. The space is fantastic, as well. I would highly recommend staying here. We hope to go back! We had a great time in New Orleans staying at this property. The guest house was clean and in a good location. The property manager was fantastic and very helpful during the entire trip. Just be sure to read the description and be aware that there is a spiral staircase from the first floor to the second floor. This was not a problem for us but could be for someone with physical limitations. We would definitely stay here again! We greatly enjoyed the guest house in New Orleans. It was perfect for my husband and me. It is a small space but we did not need more than a clean place to shower and sleep. The guest house is close to the streetcar line which we found to be very convenient. Andrew, the owner, was extremely helpful by sending emails before our trip and checking on us during our stay. He solved a small problem with a cooktop burner very quickly. We would recommend the guest house for others visiting New Orleans! Enjoyed staying at the rental property. Very nice & clean. Looked just like the pictures.